FITC-Labeled Human BAFF, Fc Tag (Cat. No. BAF-HF268) is expressed from human HEK293 cells. It contains AA Ala 134 - Leu 285 (Accession # AAH20674.1). It is the FITC labeled form of Human BAFF, Fc Tag (Cat. No. BAF-H4268). This protein carries a human IgG1 Fc tag at the N-terminus. The protein has a calculated MW of 44.5 kDa. The protein migrates as 55 kDa under reducing (R) condition (SDS-PAGE) due to glycosylation. FITC-Labeled Human BAFF, Fc Tag on SDS-PAGE under reducing (R) condition. The gel was stained overnight with Coomassie Blue. The purity of the protein is greater than 95%. Immobilized Human BCMA, Fc Tag (Cat. No. 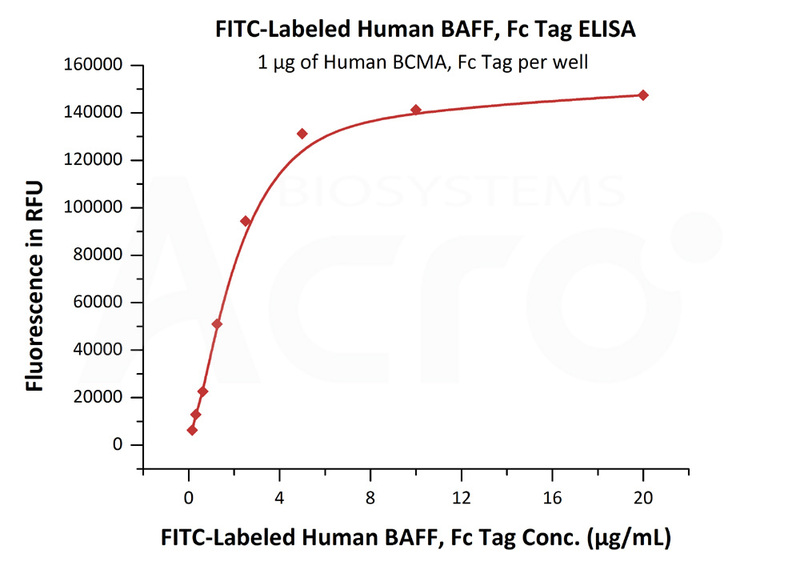 BC7-H5254) at 10 μg/mL (100 μL/well) can bind FITC-Labeled Human BAFF, Fc Tag (Cat. No. BAF-HF268) with a linear range of 0.156-2.5 μg/mL (Ex.488 nm/Em.535 nm) (QC tested). B-cell activating factor (BAFF) is also known as tumor necrosis factor ligand superfamily member 13B , TNFSF13B, BAFF, B Lymphocyte Stimulator (BLyS) , cluster of differentiation 257 (CD257), DTL, TNF- and APOL-related leukocyte expressed ligand (TALL-1), THANK, TNFSF20, ZTNF4, and is a cytokine that belongs to the tumor necrosis factor (TNF) ligand family. This cytokine is a ligand for receptors TNFRSF13B/TACI, TNFRSF17/BCMA, and TNFRSF13C/BAFFR. This cytokine is expressed in B cell lineage cells, and acts as a potent B cell activator. It has been also shown to play an important role in the proliferation and differentiation of B cells. It is expressed as transmembrane protein on various cell types including monocytes, dendritic cells and bone marrow stromal cells. BAFF is the natural ligand of three unusual tumor necrosis factor receptors named BAFF-R, TACI, and BCMA, all of which have differing binding affinities for it. These receptors are expressed mainly on mature B lymphocytes (TACI is also found on a subset of T-cells and BCMA on plasma cells). TACI binds worst since its affinity is higher for a protein similar to BAFF, called a proliferation-inducing ligand (APRIL). BCMA displays an intermediate binding phenotype and will work with either BAFF or APRIL to varying degrees. Signaling through BAFF-R and BCMA stimulates B lymphocytes to undergo proliferation and to counter apoptosis. All these ligands act as heterotrimers (i.e. three of the same molecule) interacting with heterotrimeric receptors, although BAFF has been known to be active as either a hetero- or homotrimer. BAFF acts as a potent B cell activator and has been shown to play an important role in the proliferation and differentiation of B cells. (1) Oren,D.A., et al., 2002, Nat. Struct. Biol. 9 (4): 288–292. (2) Daridon C, er al.,2008, Autoimmun Rev 7 (4): 267–71.